Lock in a great price for Monchique Resort & Spa – rated 8.7 by recent guests! Amazing view, very friendly personal, good meal, comfortable room with fully equipped kitchenette. For kids: outdoor playground and Kids Club. Perfect Location within the Algarve countryside. The suites are very comfortable and there are some with scenic view. The restaurant and bars are very good and offer outside seating. The breakfast is very good with many options. The Hotel also offers SPA. Loved the fact that they had high quality appliances in the kitchen. Bed was comfortable..and the pictures on their website was exactly as portrayed in the photos. The hotel location is excellent. new buildings, large property, very well decorated with several entertainment services and options. The rooms are large, comfortable and well equiped. WIFI Internet access was fast (30Mbps) and was available across the hotel. SPA infrastructure, services and staff had great quality. One of the best price vs quality hotels that we have stayed. Great for relaxing with family and friend for a few days. Wonderful low-key resort that makes a great base for exploring the Algarve. Staff could not have been nicer or more helpful. We loved our stay here. The bed and silence was amazing for resting. There are different restaurants with great food, we really enjoyed our degustation menu in Mon Chic. The staff was absolutely amazing, very nice and responsive to our every needs. Monchique Resort & Spa This rating is a reflection of how the property compares to the industry standard when it comes to price, facilities and services available. It's based on a self-evaluation by the property. Use this rating to help choose your stay! 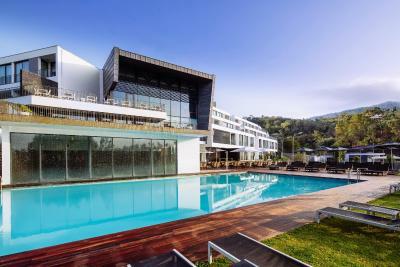 One of our top picks in Monchique.Surrounded by nature and views of the Algarve coast, Monchique Resort & Spa is located in the Serra de Monchique and features restaurants, 2 outdoor pools and a variety of Spa experiences. The Sensorial Spa features sauna, steam room, aromatherapy, an indoor heated pool, relaxation rooms, 8 treatment rooms and much more. The 24-hour gym has a variety of high-end Technogym equipment. Personalized training sessions can be booked, for a surcharge. Children between 4 and 12 years old are welcome at the on-site Kids Club available every day. Guests may engage in activities like bird watching, jeep safaris, hiking, horseback riding, standup paddle and mountain biking. House Rules Monchique Resort & Spa takes special requests – add in the next step! Please note that the credit/debit card used to book the Standard Rates is required for confirmation purposes only, no charge is made in advance. For Non Refundable rates, full payment for the stay will be taken by the resort any time after the booking is made. These charges are nonrefundable and nontransferable. Please note that opening periods of restaurants and bars depend on occupancy levels, for updated opening times of the restaurants, guests should inquire the Monchique Resort & Spa. Please note that the Monchique Resort & Spa provides a variety of leisure programs with activities related with Fitness, Family and Nature. Please contact the Leisure Team near the reception for additional information. These programs are only available upon request and are not included in the rate. Please inform Monchique Resort & Spa of your expected arrival time in advance. You can use the Special Requests box when booking, or contact the property directly using the contact details in your confirmation.